The 200-bed Oncology Institute to be one of the most advanced in South America. 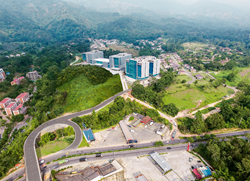 The new Hospital International de Colombia, located in the town of Piedecuesta. Most importantly, this is a milestone for the people of this region, who will have access close to home to high-quality, leading-edge cancer care—access that will save lives.